It was a pesky glitch: an intermittent problem that tripped the breaker and interrupted the 480 V power to one of two 100-horsepower fan motors driving the dust filtration system at an Ohio asphalt plant. But not a major safety problem. At least that's how it looked. For Jeff Conover, asphalt performance manager for Oldcastle Materials, the job was to find the cause and get the plant running right. 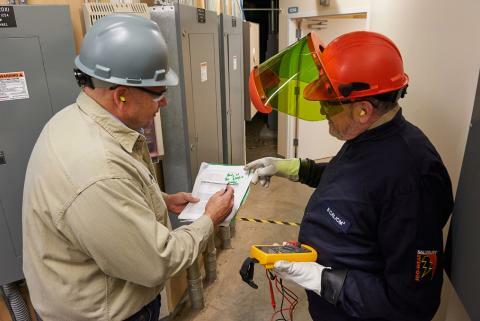 Safety topped Conover's expectations as he and plant foreman and electrician Charlie West locked and tagged-out the motor control center and set up their tests. 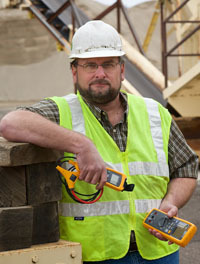 And the team had a safety advantage: a Fluke CNX™ Wireless Test System (this product has been replaced by Fluke Connect®). "It caused that thermal overload section of the motor starter to literally blow up and explode"
"On that day we were starting to get more problems on our exhaust fan on the bag house (dust filter)," Conover said. "The exhaust fan has two 100-horsepower motors on it. We were tripping the overloads on one of the motors. We assumed that we had a bad motor. We had changed the motor and it still continued after we megged it out. We kept diagnosing and we were going to check the amps to see which phase was causing the trips. That was when we put the Fluke CNX System on. And the next time we hit the start button the explosion happened." "We were standing in the control house," he said. "We had all stepped out of the motor control center. We asked the plant operator to go ahead and start the exhaust fan. As soon as he hit the start button a small shotgun blast back from the control center sounded. Something had burned up, or flashed. My first thought was I was glad nobody was in the room. "My second thought was the CNX, even though we didn't get any readings, did what it was supposed to do. We were able to leave the motor control center room and step around the corner with the CNX because we were able to read the meter without being in that location. Because the team had stepped out of the room and were 15 feet away they didn't see the arc flash, but the damage when they returned was obvious. "The weakest link in our circuit was the thermal overloads in the motor control center," Conover said. "When that shorted it caused that thermal overload section of the motor starter to literally blow up and explode. It actually burned the overloads themselves into multiple pieces. The thermal overload had to be completely replaced before we had the chance to run it again. The timing of the short Conover attributes to luck - it just happened to occur while testing was underway. The fact no one was injured? That came from good safety practices and using the right gear. "It was just luck as to the time that it did happen," he said. 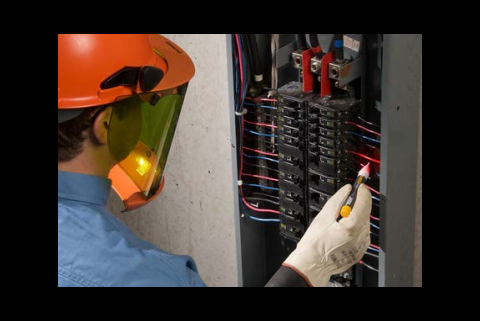 "It also gives you an understanding that even though the short was 100 feet away, it doesn't mean that's where the arc flash was going to happen. It happens at the weakest link, and we don't always know where that weak link is."